Lep`i`dop´te`ra (~dǒp´tė`rå): n. pl. 1. (Zoo.) 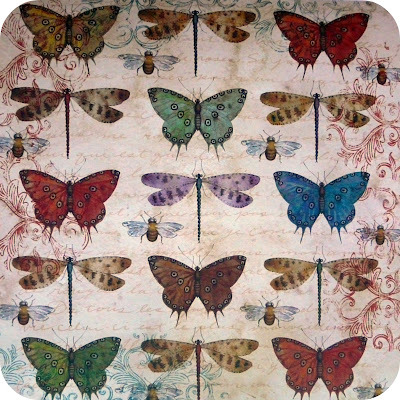 An order of insects, which includes the butterflies and moths. They have broad wings, covered with minute overlapping scales, usually brightly colored. -Webster's Revised Unabridged Dictionary, published 1913 by C. & G. Merriam Co. I finally put away the winter stuff and was thinking of a way to pretty-up the mantel for Spring. 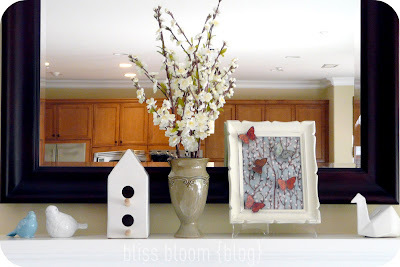 Since I hit up the sales and recently purchased a ceramic birdhouse from West Elm and little ceramic birds from Michaels, I thought I'd fill-in the rest by using things that I already have onhand. 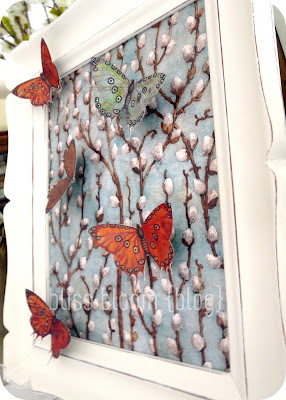 I made this butterfly frame in less than a half hour by using an old frame and scrapbook paper. I've always been fascinated by butterflies and love to walk in the live exhibits and watch them in their natural habitat. But looking at specimens... ah, not for me. 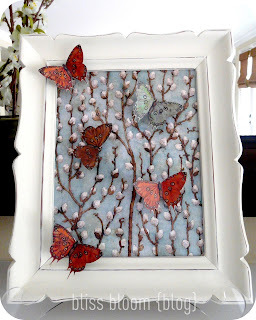 So this paper version is perfect if you like the look of real butterflies without the "ew" factor. 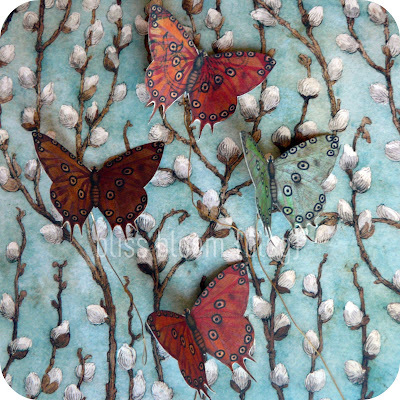 I had several wired paper butterflies leftover from my mom's garden birthday party last fall. I had cut them out from this beautiful collection of paper (purchased at Michaels) and glued a wire to the back. So all I did was find a coordinating paper that I liked, cut it to size and glued on the butterflies (for aesthetics, I poked a hole through the paper and glued the wire to the back). I folded the wings a little to give them a 3-D effect. Then I removed the glass from an old frame (for safe keeping, I tucked the glass behind the art & a piece of cardboard) and that was it. 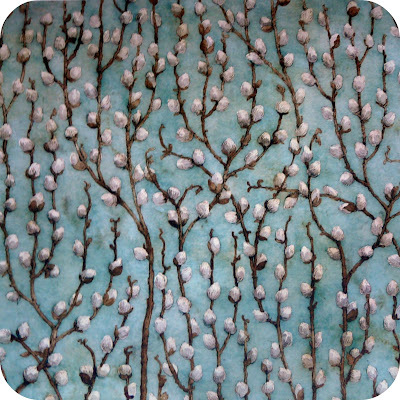 Here's our Spring Mantel. I'll probably add some of these Eggs when we're close to Easter. Easter seems so late this year-- April 24th, the last Sunday in April, but I'm sure it'll be upon us in no time. Hope you're having a nice week! Are you ready for Spring? ?